This week, I've had several appointments and have thus been capturing bits of sewing here and there. I am so thankful to have a space that I can walk into and pick up where I left off. Before going out for my second appointment this morning--I got my hair cut-- I cut and backed a couple more pieces from my reject box. I didn't really like the effect or the colors but with the blue background added and some stitching, I think it will make a nice bag or maybe mug rug. It is about 4 1/2" by 6 1/2". This one was a from a series of Gelli printed ulips that I did and it really wasn't working. Definitely a reject, but a little black free motion stitching and more color added to the tulip, and I think it will suit a small project. I've almost finished the stitching on this piece and think I will add a border before adding the final quilting. In another post, I will show you the batik that I think is perfect for it. As usual, I can;t get through a day without watching and photographing some birds. The male purple finch visited briefly. It was one of those days where it was supposed to go one way and went instead in a completely different direction-- in a good way though. Yoga this morning was cancelled due to more snow on the way, but my friend and I wanted to do something, so we went snowshoeing. The snow was light and falling gently with no wind. Then our other friend is leaving Friday for the South so since it wasn't yet snowing too heavily, we met her for lunch to wish her bon voyage. After finishing another bagette yesterday, I could do something new. I didn't really have enough time to get into my larger fiber art pieces. Still in the mood for rummaging into my scrap boxes, I found some pieces that weren't big enough for bags but just right for bookmarks. Back them with a heavy stabilizer. Free motion stitch it all down. See what a difference a little stitching will make? Add fabric to the back and zigzag around it. I'll add them to my box where I collect little gifts to use for friend's birthdays and such. 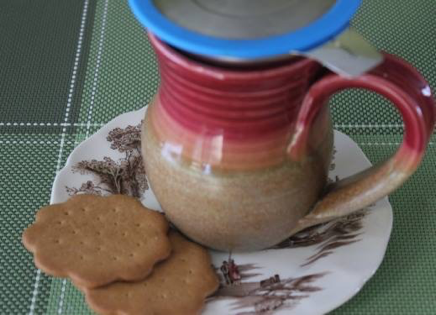 Add some tea and boo for a perfect personal; little gift. It seems the weekend went by in a blur. We were not overly busy, just nicely busy. 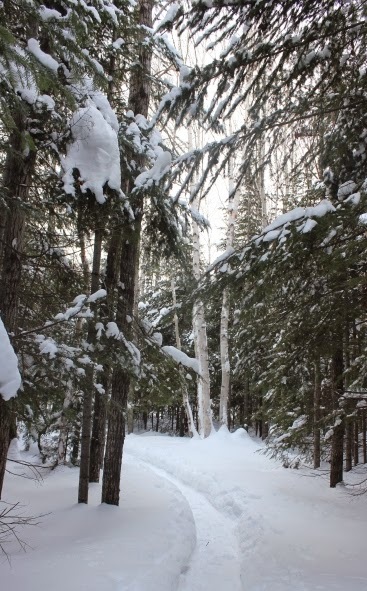 On Saturday, I went to my sewing group, taking some hand quilting and coming home early to go snow shoeing. I went out on the trails again Sunday with a friend. I didn't get much sewing in due to the stretching and soaking needed after the activities. Bad weather days will bring more studio time. I'm just so happy to be able to get out considering that I was barely able to walk for a while because of my hip. This is as near to perfect place as it gets for me. The air was cool, but not too cold, the snow perfect, and look at that sunlight glowing through the trees. I went again this morning. It's going to get cold and we're expecting more snow on Wednesday. I am nearly ecstatic that I can now get my snowshoes on by myself! In the last few years I've had to get my husband to do it, thus not being able to go out alone. Healing my knee and sticking to daily yoga have made it possible. Today, I could take the camera, some birdseed, and stop when I wanted to. On the weekend, we were followed by some hopeful chickadees. Today, I was able to feed them. Since I have an appointment today, I must get going and won't have studio time. I did a little colored pencil and watercolor study at breakfast this morning of some twigs that I picked up. I did the bottom drawing this morning with my tea and the top two yesterday. I love that I have a sewing studio that I can leave my work set up in--sometimes still with the sewing machine needle in it-- and that I can walk in at any time to do a little stitching. I also love free motion stitching and even a few minutes is satisfying. Working on two versions of a scene is good too. I'm seeing the advantages in switching from one to the other without the need to change thread colors. I have translated a little organizational tool learned from a friend ( thanks Sue) into keeping my threads for the current project corralled. I purchased a bunch to use in a shallow drawer for sorting thread by color. The extras bins are great to take matching colors for the current project to the machine. I used to have them rolling around on the top of the cabinet and of course falling off, dah. Before Christmas, I purchased some solar powered colored lights and used them on my branches that are tied to the back deck. As the days grow longer, the lights are staying on longer--currently until nearly close to 10PM. It is such a pretty view. I was greeted by this sight of the same view this morning. And here's my birdie pic of the day. I've had a lovely day and I'm just popping in to show you my projects. Before I went out to lunch with a few quilting friends, I finished 2 more of the little zippered bagettes. They are from an Atkinson pattern and come int 3 different sizes. I'm having such fun going through my printed and painted scraps to use as the inside of the bag that shows behind the vinyl front. Even a tiny scrap added to strips of fabric works. I got home around 2pm--we visited a little shop nearby that I hadn't been to that carries a little bit of fabric, zippers, buttons,etc and I even found my sewing machine light bulb there. Supper will be an avocado, tomato, chicken mix, in tortillas warmed with cheese. Easy peasy., so off to the studio I headed again. I did a little free motion stitching on the painted fabric pieces form yesterday. I only started a second one because the first one seemed to have bled a lot but it faded enough and I think it'll work. It's actually easier to work on 2 at a time as one doesn't have to change thread quite as often. I'm working form back to front. It always helps to see it up on the screen to scrutinize it and see what I would add or change. The shanties and the people are not yet worked. My hubby is leaving work at 4 to come home and we will get a walk in before dark. It is sunny and finally warmer. I love February for the warming sun and longer days! You know I really do go through my day lost in my thoughts and musing about my fiber art pieces and how I might proceed. Since my word for the year is 'focus', sometimes it seems I'm not doing a great job. I have been trying to focus on being present when I'm eating, doing yoga, and exercising at least. The rest of the time I dream away. Like many Atlantic coasters, we had a big storm yesterday; the wind and the drifting have continued today, and so, many things including highways are closed. I ventured out for a while this morning to clear the front walk and the bird feeder on the back deck. No sooner did I close the door, the birds swarmed in. While making my lunch, I got caught up in the antics. I really felt the curious stare of this pine siskin. My kitchen window is such a bright sunny place and I've often dreamed of having a small bay window filled with plants. While this isn't affordable at the moment, some pictures on Pinterest inspired me to add some greenery around the area. I dragged out a macrame hanger that I made some 30 years ago! I've seen a comeback of them on the net. My husband put a hook into the ceiling and I put it up this morning. He's also going to replace the pine shelves with wider and longer boards so I'll have more plant space. I want to add another small shelf on the lower right and then I'll have lots of green space. I often don't know just what I'll pick up to work on when I walk into my studio. My intention today, was to add more thread painting to my current fiber art, but upon entering the studio, I got distracted by my open sketchbook with the sketch that I did of more shanties yesterday. Some white cotton fabric was still resting near my iron ready to be drawn upon. What could I do? I quickly traced a few lines onto the cotton and then used my Inktense pencils, The Neocolor II crayons and my water-brush to add some washes. The photo above is still wet; there is some bleeding (it's a challenge to know just how much water to use on the cotton) and the colors will fade some as they dry. I never know if it will work, but often once it is dried and heat proofed, the stitching will add definition.. Happy Monday! I hope you're having a good one, maybe with a bit of creativity-- even it's hanging a plant or making dinner-- wherever you live. I'd love to know what you're up to. Yesterday we made the 1 hour drive to Campbellton where I took my 'new to me' machine to be serviced. It seems to be free motion stitching like a top now although I haven't tried it yet. It was sunny, but cold, so a nice day for a drive. I picked up some wool, a new rotary cutter, and a piece of fabric. It's a little shop with a bit of everything. We are now in the midst of another nor'easter and I've been in my studio all afternoon. This morning, after French toast for breakfast, tea and the usual newspaper reading and crossword solving, I made muffins. Just before lunch, I led my hubby through my yoga routine. I'm truing to get him back into it. He used to do it regularly and hasn't for some time. The little birds, including this red-pole, don't really seem to mind the storm, only snuggling into a branch on the lilac tree when a wind gust comes up. In the studio, I started by sorting and organizing a few things. Since I hadn't pulled my machine out of the bag yet, I decided to cut out a couple more kits for the little zippered bagettes that I ve been making. It seems I'm not done with them yet. I cut up some sun prints, again pulled from my box of scraps. It feels like treasure hunting when I find a piece that will suit. And finding coordinating fabrics is equally fun. A little free motion stitching to accent the wild flower print.' loosey goosey'! Then I threaded on the black thread and went back to adding still more shading to the rocks. When I'm sure it's 'there', I will move on to the dark grey, then lighter grey, etc. Since the front doesnt look much different, I thought I'd show you what the back looks like. There is white stabilizer on the back. What you see is all thread. I've just been listening to the news about the storm around the maritimes and it seems some places are really being hit.flooding and collapsing rooves in Halifax, NS. I guess we should be glad for the snow although the weight of that can cause problems too. Let's hope this finds you, my readers safe and happy. Today was a good day today-- yoga class this morning, lunch with friends and a 3 month old to coo over. I picked up a few groceries on my way home as we're heading out of town tomorrow. I'm taking my 'new to me machine' to be serviced and I'm picking a free motion foot for it. While preparing my tea, the flock of birds at our feeders once again caught my eye and I took quite a few photos! 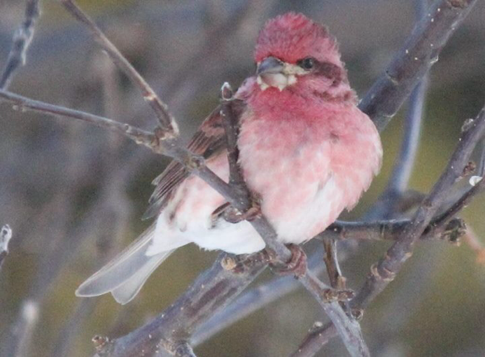 The male purple finch is so pretty! 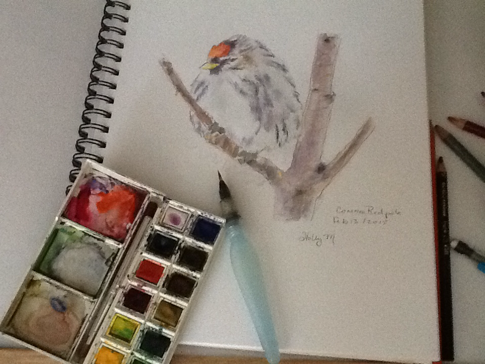 I had about a half hour left before I needed to pick up my husband, just enough to do a quick sketch of a common redpole using my current favourite -- a combination of colored pencils and watercolor. It's supposed to be good for inflammation and the cinnamon helps lower blood sugars. Very tasty too! Well, if you're in the area in Canada and the U.S. that is expecting the storm, I hope you stáy warm and cozy. It's due here on Sunday. It's another soft gray here today-- not too cold--our outside thermometer said -7C around lunch time. We've had a gentle fall of flurries most of the day. I love the quiet softness of a winter day. This morning, I did a session of yoga after rising and having a light snack. Then, I had breakfast and my tea before heading into the studio. My gosh, I feel so spoiled to have the 2 machines set up! I sat for about an hour and free motion stitched more black shadows on the rocks. There is also a very pale rust high lite color in the photo which I cannot quite duplicate in thread. I decided to stitch a close shade on to see how it looked It can be blended in with the addition of another shade. I think it's improving but I still see areas for more shading before I add more high-lites. The last thing will be a bit of greenery here and there amongst the rocks. At lunch time this little fellow (lady?) came for a visit. It comes every day a few times and eats it's fill. I've found little tunnels in the snow all over the yard and on the deck. I've had the usual birds all day, but today a winter robin showed up. There are a few that will over winter. You can see white downy feathers near their behind. Once they discover a few apples they will return until the apples have all been eaten. This time of year, food may be getting scarce. Taking advantage of the two sewing machines set in different sewing modes, after lunch, I moved to the other machine and started putting together the other little Bagette. I didn't quite get the last step done of wrapping around and stitching down the edges. Next time. You know I'm not one who likes to do repeat projects, but these little bags are quite addictive. I think it's because they make up quickly, are very useful for holding quilting, knitting or any small notions, or jewelery and it's so fun to use up my scraps. I'll be looking into my scrap box for more.